“Assassin’s Creed 2” features several hidden glyphs that players can find and scan to activate a puzzle. Once the puzzle has been solved, a file unlocks that reveals a small section of a video file known only as “The Truth.” The 17th puzzle in this sequence is known as “The Bunker.” To solve this puzzle, players must first enter a code made up of several symbols, and then locate an Assassin’s logo hidden in an image. Select the red box under the number 9 and scroll to the symbol shaped as a bowtie. Highlight the red square under the number 1 and scroll to the symbol that shows a diamond within a diamond. Press the “Submit” button. Move the view reticule to the top-right corner of the building in the picture and center it on the Assassin’s logo on the white wall, above the slanted roof section. Press the “ID” button. This will always be the 17th puzzle, no matter what order you scan the glyphs. Activate “Eagle Vision” to find the glyphs more easily. They are highlighted red. 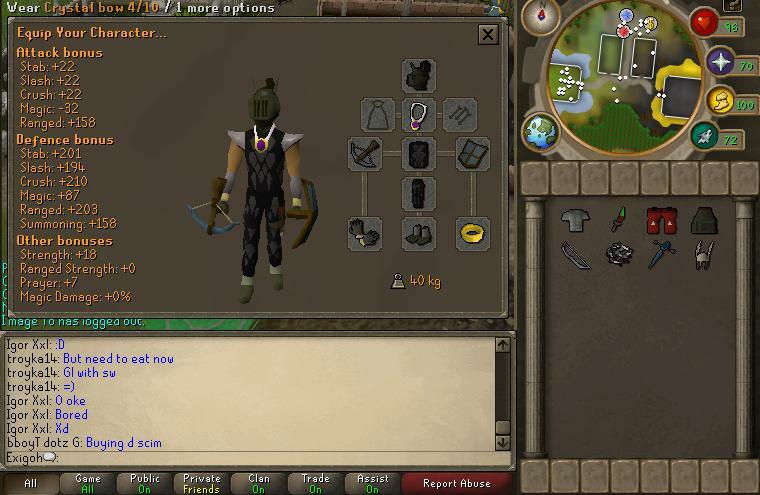 This is a guide made to help you how to play soul wars. 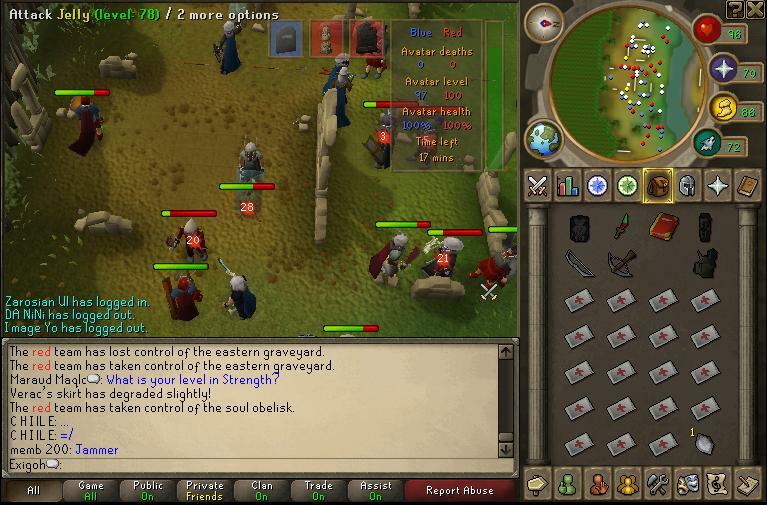 Soul wars is a P2P combat-based mini-game with 2 teams: the red and the blue team. It’s like castle wars, you have to play like a team to win. It’s also a safe mini-game. There are no requirements, it’s known as a good training method for lower levels. 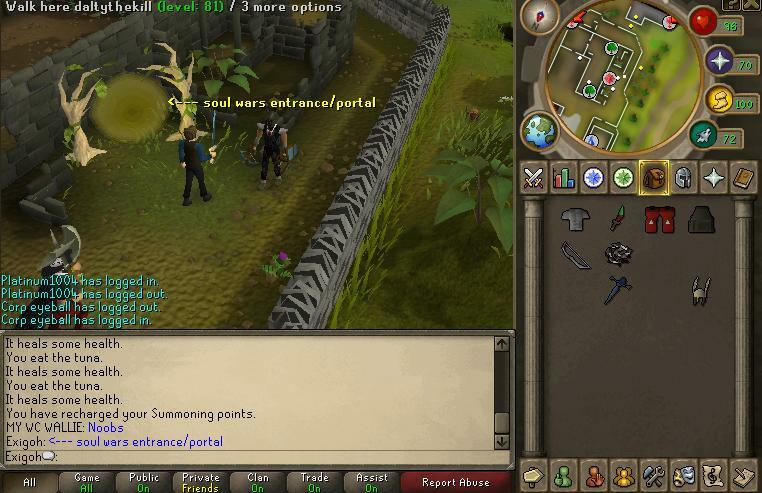 Soul wars can be founded south – west of edgville. You can see it on your mini-map with the mini-game symbol. You can also bring ancients or chinchompa’s to hit multiple players. 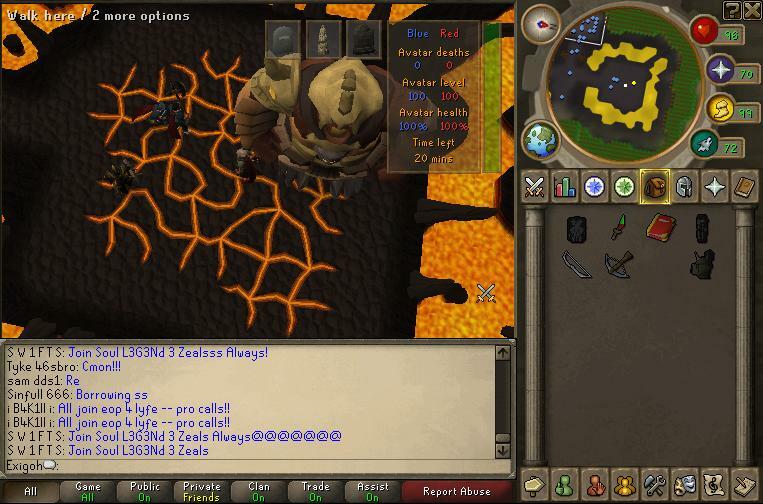 If you are playing soul wars you can either choose to get experience or kill the avatar. If you want to get experience only, you can kill pyrefiends or jellies the whole game. You can get about 10-20k xp in a single game. If you choose killing the opponents avatar, you can do some things to help your team. The main part of soul wars is killing the avatar of the other team. The avatar will have a certain level. 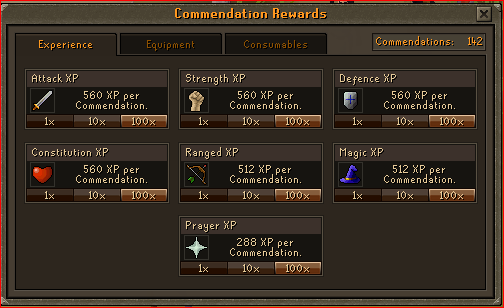 In the beginning he will have 100, but you can decrease it by taking soul fragments to the soul obelisk. 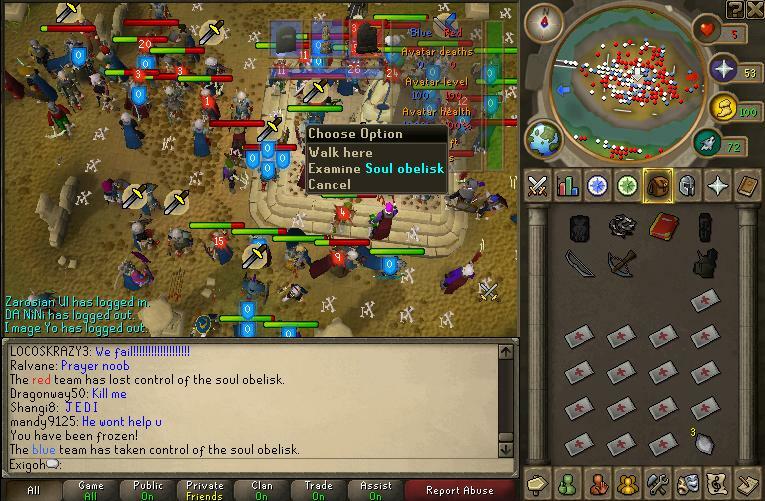 The soul obelisk can be found in the middle of soul wars. The soul obelisk can only be controlled by one team, this means if your team controls it, you can use your soul fragments on it to lower the avatars level. If your team doesn’t control it, you will have to fight to control it. To obtain soul fragments you’ll have to kill pyrefiends or jellies. These will drop a certain amount of fragments. But if you get killed, you lose your fragments!!! When you die, you will end up in the graveyard that your team controls. You will have to wait 15 seconds before leaving it. If you have lowered the avatar level of your opponent, you might be able to attack the avatar. 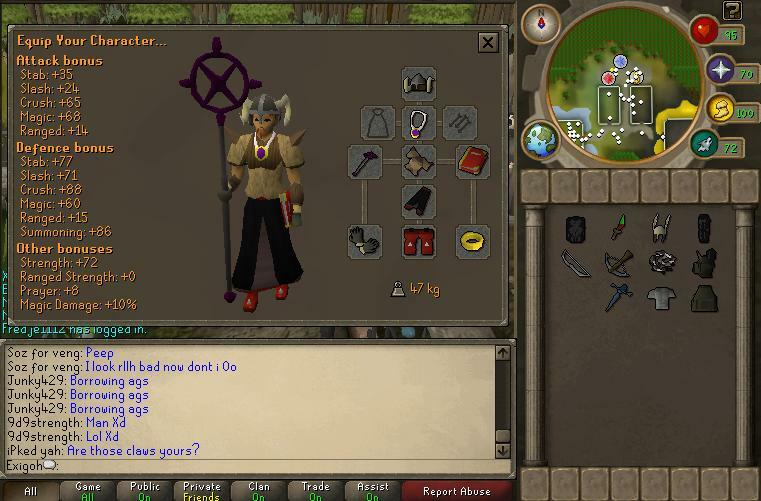 This depends on your slayer level, if your slayer level is higher then the avatar’s level, you will be able to attack him. 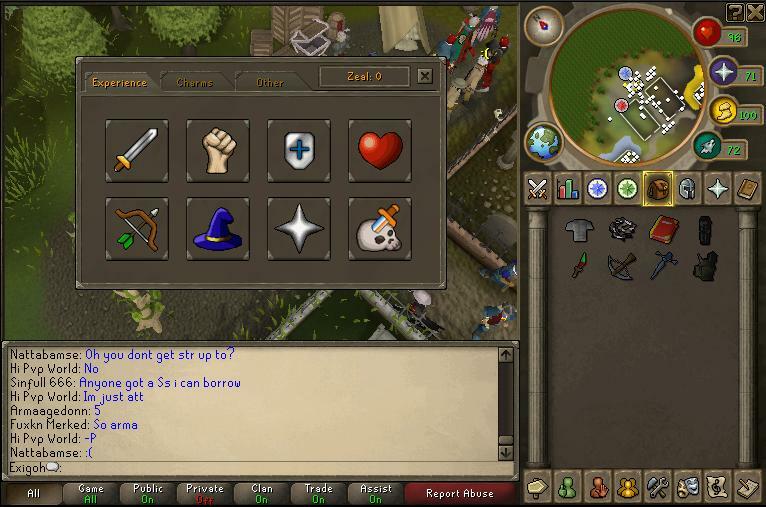 Burying bones will restore the avatar’s level. You can’t bring any food inside the ‘arena’. But you will find bandages, explosives and barricades close to your camp. Watch out for the ancients and chinners, as this is a great spot for them. You will get a reward each game. This can go from 1-3 points. Losing team gets 1 points, winning team 3 and if there’s a tie everyone will get 2 points. 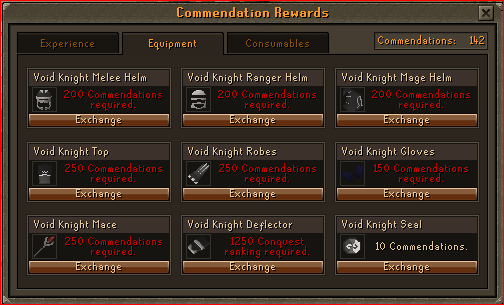 You can exchange these points at nomad or zimberfizz. 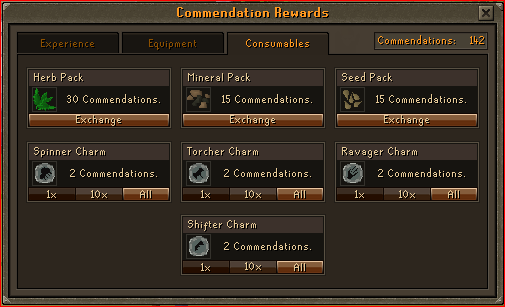 You can choose bteween the experience, charms or summoning pets reward. 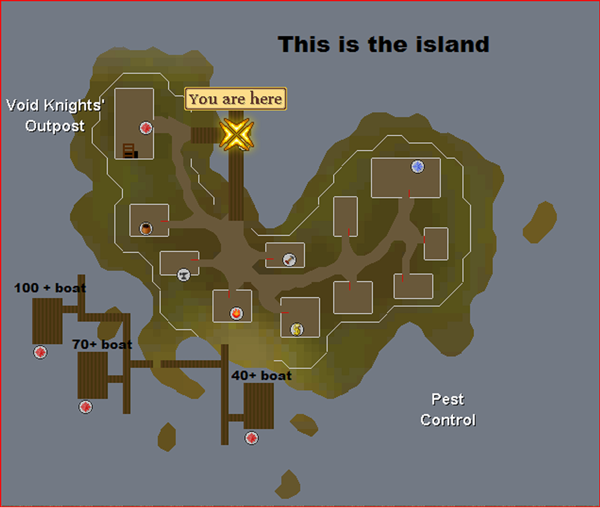 Once here you head to the lander of your choice depending on your combat lvl, once the lander has 25 players you are taken to the main pest island as shown below. Obviously, destroying the 4 portals is a much faster and easier task than trying to keep the Void Knight alive for 20 minutes. 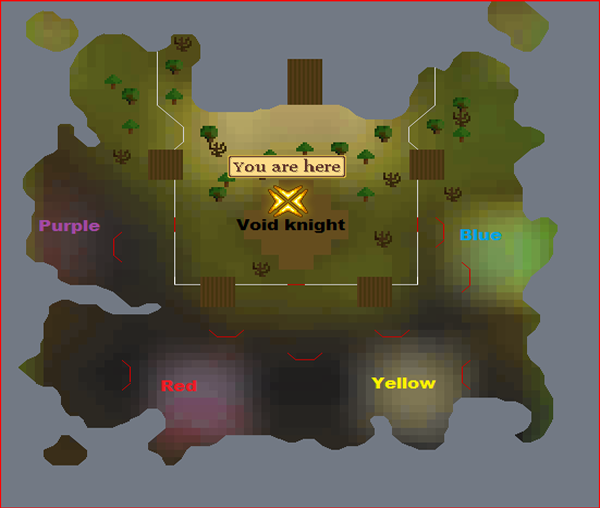 While it is helpful to have a few players killing the Void Knight’s attackers, a majority of players should be focusing on the 4 portals. Here is a breakdown of what each player should do. Those killing portals should head as soon as possible to the portal which is first to be unshielded, the first unshielding occurs 15 seconds into the game. If any Spinners are in the vicinity of the portal they must be killed as quickly as possible as they can heal the portal’s health. This is also a priority as when a portal is destroyed, any nearby Spinners will explode, poisoning you and nearby players. Also, if you see a Ravager appear, you should kill it before it can break down gates. Otherwise, your full attention should be on destroying portals, and you should not even bother attacking the other unspecified NPCs. For the best chance of success have all Portal Destroyers attack and destroy each portal as it becomes unshielded. A new portal becomes unshielded every 30 seconds. Moving as a large team should allow you to destroy the current portal before the subsequent portal becomes unshielded. .
hits the Void Knight. You may even want to have one or two protectors to the south, on the other side of the gate, to attack any defilers that may be ranging the Void Knight. If you want to have an assured victory, have about 5-8 of your 25 people be Protectors. Have 2 of them stand in front of the East and West gates, open or closed, to block the NPCs that walk in (as they can not walk through you). These players will get experience fighting them off as they come to the gate, so their position is not a fruitless one. (Alternatively, these players can lure Brawlers onto the platform to block for them.) Have the others kill the various shifters, or other creatures, that managed to get through by some way or another, and protect the southern gate. This will greatly help protect the Void Knight while the other players work on portals, and you will never have to worry about if the gates are broken down. Make sure the 2-3 players blocking are in their position the entire time. If they move, the line will break up and they will not be able to block your enemies alone. 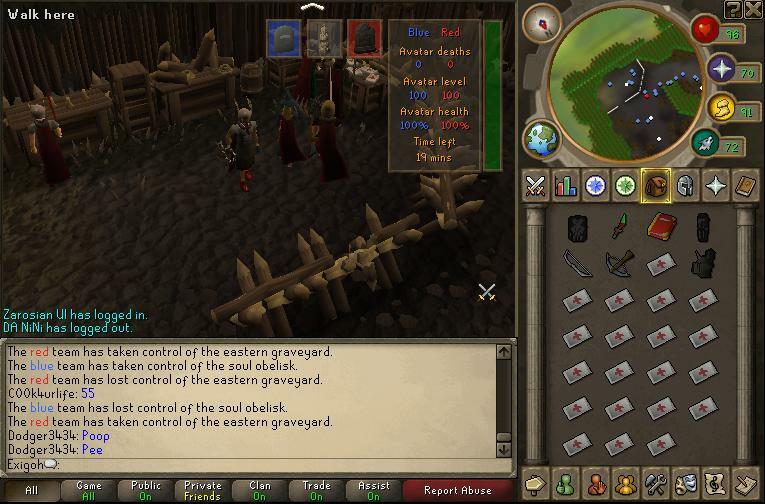 Remember, if you are blocking at the East or West gate, you can ONLY attack the NPC adjacent to you. Ignore the Ravagers and Splatters that may wander through you, and just attack the enemies in line as they approach you. Players blocking the East or West gates can choose to do so outside with gates closed, or inside with gates open. In either case, if you are not blocking a gate do not go near them, and DO NOT KILL BRAWLERS BEING USED FOR BLOCKING. Walking through these players or killing these Brawlers allows the enemies to pass, so even though you may be trying to help repair a gate or get a little xp/zeal, your actions could be counter-productive. While the game is in progress, the top right corner of the game window will display the health status of the portals. If there is a grey semi circle in the portal picture, it means that the portal’s shield hasn’t dropped yet. The top left corner displays the Void Knight’s health status, the amount of damage you’ve done and the time left to play. Note: You will only get half the experience when fighting. For example, if you use aggressive mode on your weapon, and hit a 200, you would normally get 80 Strength experience. But in Pest Control, you only get half of that, 40 experience. Each portal is week to diff styles of attack and its usefull to take range and melee weapons to each game. Below are the portal patterns. 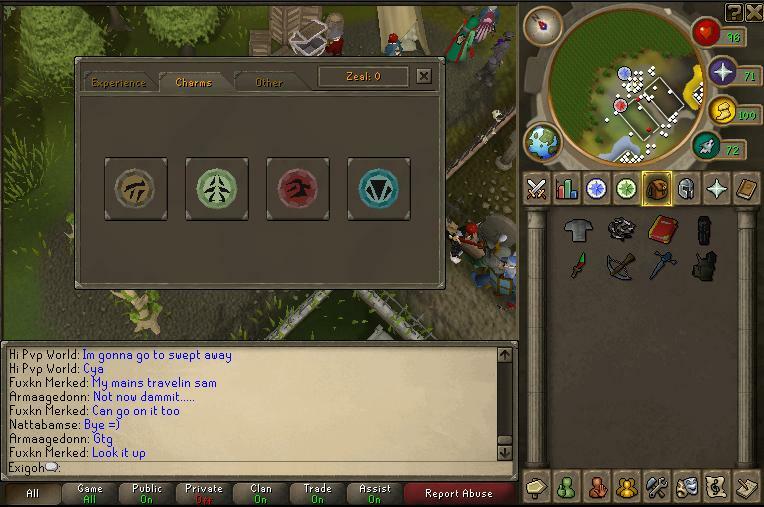 When playing pest control please make sure you attack the spinners so they do not heal the portals and remember to attack the portal closest to you. Players with 45+ Ranged may wish to use Chinchompas as their exploding attack will deal a massive amount of damage to the monsters surrounding the portal. The attack damages up to 9 monsters in a 3×3 area surrounding the targeted monster. Since the themed worlds update, Worlds 53, 69, 115 and 144 have been designated PC Central. You can pretty much guarantee that at any time, day or night, there’ll be enough people there for a game. 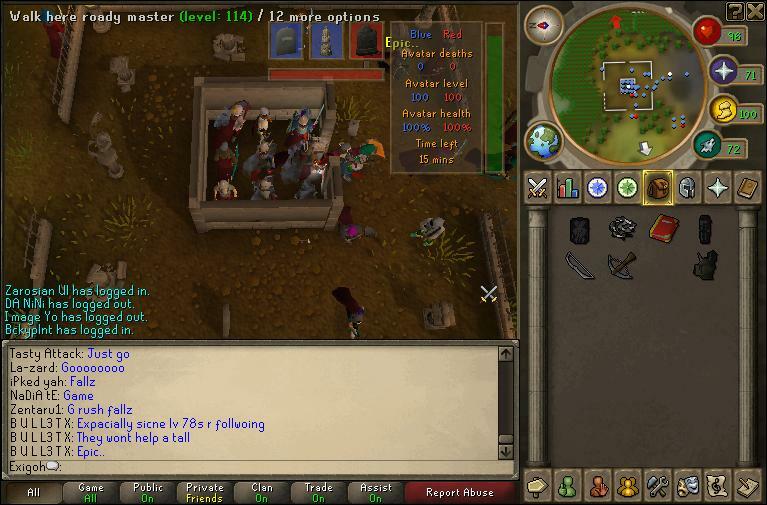 World 144 is usually the Pest Control world for 100+ players that aren’t in a PC group. You will see them on dock recruiting after there clans hop worlds. The Novice boat gives 2 points. The Intermediate boat gives 3 points. The Veteran boat gives 4 points. If you win by destroying all 4 portals, you will receive GP as well, which you get at the end of the round without needing to redeem any points. The amount is 10 times your combat level, so if you are level 100, you will get 1,000 GP for each successful voyage. For example, if you have level 70 in attack, using your point to raise attack would give you (702)/600 = 4900/600 = 8.166666667. That rounded down becomes 8. Then 8 * 35 = 280 experience. If you exchange 10 points at once, you get a 1% bonus on top of the per-point amount. And if you exchange 100 points at once, you get a 10% bonus. At level 70 attack, 100 points would get you 280×100 = 28000. 10% of 28000 is 28000 * 0.10 = 2800. 28000 + 2800 = 30800 experience. It’s like getting 10 points for free! 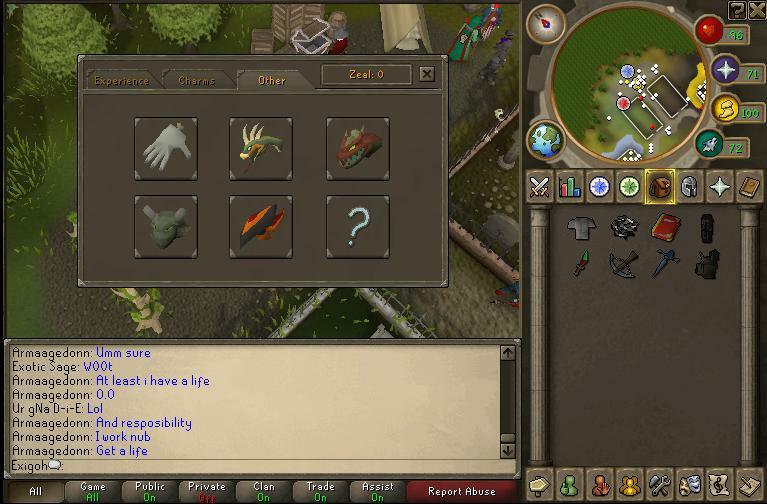 Points can only be spent 1 at a time, 10 at a time, or 100 at a time, so spending them individually would involve a *lot* of clicking! For these reasons, it’s worth saving up until you’ve got 10 or 100 points and using them at once on one skill. Nothing more to say except HAVE FUN AT PC ! ! ! ! ! ! ! !